The current NATO threat landscape is characterized by a combination or “hybrid blend” of unconventional emerging challenges (like cyber and terrorist attacks) and re-emerging conventional ones (like Russia’s recent military resurgence and assertiveness, that led to the illegal annexation of Crimea and destabilization in Eastern Ukraine). While the resurgence of the Russian military activity pushed the Alliance in the direction of re-discovering its deterrence and collective defence role, the new, not-traditional, trans-national and essentially non-military treats that generate effects below the threshold of an armed attack require a new paradigm shift with a focus on resilience although the protection of critical energy infrastructure is first and foremost a national responsibility, NATO can contribute to meeting the infrastructure protection challenge on many levels. Given the fact that its core deterrence and defence mandate relies in a great measure on the security of Allies’ energy infrastructure NATO’s role and actions in reducing the vulnerabilities and strengthening the resilience of such infrastructure can only increase. A multi-faceted, multi-stakeholder and networked approach is needed to be able to strengthen defences and resilience of critical infrastructure such as energy. Understanding and defending against cyber or terrorist threat vectors, increased situational awareness, education, training, exercises, trusted partnerships as well as increasing strategic security dialogue and cooperation are key for such a comprehensive/network approach to the challenge. 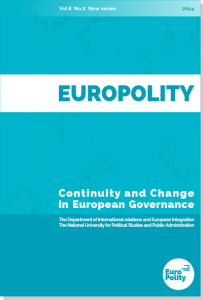 The answers offered by EU Member States in sensitive moments (the financial crisis of 2008, the refugees` crisis, the terrorist attacks), have eroded European citizens` confidence in the Union’s capacity to manage such surprising and unprecedented dynamics, while simultaneously deepening their perception of EU as a partially delegitimized supranational entity. Right-Wing populist parties have gradually increased their attractiveness by capitalizing on the frustration and disenfranchisement feelings perceived by European citizens. European populist parties promote the alternative of a direct opposition towards the system`s political correctness and against the perceived blockage of democratic debate, on their path toward gaining real effective political power. I will start with a short introduction of a theoretical approach of far-right populism in Europe. Using a qualitative research method, defined by discourse analysis (speeches, statements), I will then illustrate the way the political programs of Alternative for Germany (AfD) and Le Pen`s National Front (FN) were thought and built in order to understand how these have led to an increase in the appeal of European populist parties. In the conclusions section I will evaluate the impact of these political alternative movements on the future of the European Union`s essence, on its main values and principles. If we think about the starting point of the cooperation between Latin America and the Caribbean and the European Union, we may have various alternatives in mind, but the frameworks that have been set up in 1999 by the First LAC-EU Summit of Heads of State and Government and in 2013 by the First CELAC-EU Summit of Heads of State and Government, we encounter a biregional partnerships between peers, based on common grounds established by the two parts. As a continuation, the cooperation extended to education, which is one of the domains outlined as important from the very beginning and which produces effects upon other features. Therefore, it is interesting to analyse the formation of the Permanent Academic Forum (FAP ALC-UE), its methodology for the process of bioregional partnership and the process of Academic Summits organised by its members. On the background of the Ukrainian crisis, the relations between Russia and the Euro-Atlantic community reach a new critical point. The article aims to follow the way in which this tension unfolds in the Serbian society. It starts with identifying the types of discourses related to the idea of „friendship/ brotherhood” between Serbia and Russia. The selection of discourses is composed of statements belonging to officials from Belgrade, the political parties and the civil society. Using the poststructuralist approach, this study starts from the idea that international relations and a state’s foreign policy are strongly connected with the meanings attached to concepts or ideas. Such meanings are not given by a certain objective historical evolution, but can be constructed or deconstructed by the political, intellectual, social elites within a community. The discourses, collected from the November 2013 – April 2016 period, will be analysed with the Foucauldian Discourse Analysis method. Firstly, we will see how the idea of friendship between Serbia and Russia is constructed or deconstructed by several selected elite groups (how the different discourses are organized) and secondly, if the particular types of discourses imply certain specific foreign policy positions, justified by the elites as being directly linked. Conclusions indicate that Russophilia is a powerful legitimization tool, even in a context where this approach creates missed opportunities. On the contrary, emotional arguments prevail and strictly rational foreign policy decisions can be easily antagonized as breaking the norms of good international behaviour. *This work was supported by a grant of the Romanian National Authority for Scientific Research and Innovation, CNCS – UEFISCDI, project number PN-II-TE-2014-4-0534. The Ukrainian crisis has been a test for the alignment of Romania and Bulgaria with the EU on the background of the Union’s new foreign policy instruments as redesigned by the Lisbon Treaty. This paper aims to present the positions of Bulgaria and Romania towards the events of 2013-2015 in Ukraine. Our research target is to identify the driving forces that shaped these positions, to analyse and describe the main foreign policy goals and actions of Bucharest and Sofia regarding the Russian-Ukrainian conflict, and to compare the attitude of these two countries toward the Ukrainian crisis. The paper analyses first the Romanian and the Bulgarian perspectives on the dramatic events in Ukraine in the first half of 2014. The positions of the two countries are further placed in the wider international context of the Ukrainian crisis – the UN resolutions, the EU sanctions against Russia, NATO activities, and the security in the Black Sea region. In the third part Romania and Bulgaria are viewed as a “playground” for the competing narratives and propaganda in regards to the Russian-Ukrainian conflict. We also examine the economic impact of the crisis on the two Balkan countries, as well as the efforts of both Bucharest and Sofia to protect their respective minorities in Ukraine. In conclusion, we summarize the results of our research and explain how the Ukrainian crisis has reshaped the foreign policy debates in Romania and Bulgaria. The paper aims to look at the European Central Bank governance in terms of decisions taken to deploy a new kit of unconventional monetary policy measures, in order to respond to a new economic paradigm characterized by dynamic change in evolution, high volatility and enhanced financial risks. As an institution, the European Central Bank is led by the Governing Council and the decisions taken on how to use monetary policy impact an entire financial system. European Central Banking governance is about safeguarding the common currency and ensuring a future for the economic and monetary area to emerge stronger. For this purpose, when conventional monetary policies reach limits in their effects, it is time for the European Central Bank governance to analyse and assume the decision to deploy the arsenal of unconventional monetary policies. The experience of recent years showed a positive effect of the European Central Bank’s unconventional monetary measures, but costs could rise in case of extensive use of such measures. When these measures are used in combination, the effect is amplified and the European Central Bank needs to assess when it is time to withdraw the support, how to communicate and what exit strategy should use, what the costs are and impact can expect. THE EUROPEAN ENERGY POLICY – A FRAMEWORK FOR DECREASING THE GAP BETWEEN MEMBER STATES. IS THE ENERGY MARKET LIBERALIZATION A SUSTAINABLE APPROACH OR AN ONGOING RISK? Energy independence was a long-time dream of European Member States, thus numerous regulations and actions were designed specific for its implementation. In a society characterized by constant evolution, energy independence is regarded as a proof of the existence of coherent supranational strategies, but also as a necessary effort that is to be unravelled at national level. Unlike the first actions in the energy sector, the current market is the expression of a competitive space that has adapted an approach depending upon efficiency and sustainability. In this paper, I present, using a macro-level approach, the transformations of the European energy market and the challenges that arise. I examine both the actions that lead to the liberalization efforts, as well as the disparities that characterize the Member States involved in this process. Therefore, I question the process of liberalization of the energy market as being a straight-forward one and I investigate the variables (such as types of energy and national energy strategies) that directly influence this process. This aim of this paper is to offer insights, using both a quantitative and a qualitative approach, in the way in which the liberalization process ought to occur, and elaborate on the country-specific factors that affect it, making liberalization a process characterized by vulnerabilities.